We got this little cutie a couple of weeks ago when some one alerted us that he was dumped at East Valley shelter. Chance (we named him that as that is what he needs) is a 5-6 month old male Pug. Full of love and energy, but Chance is paralyzed. The owners just dumped him and left him there to die. He was red listed, meaning ready to be put down, when we were alerted. We got him out in the nick of time. Rushed him to our Neurologist, unfortunately he was out of the country, so another Neurologist saw Chance. He did an MRI and it showed that Chance has a birth defect on his spine that as he grew put pressure on the spinal cord and he became totally paralyzed. We were told there is nothing we could do, to either put him down or get him a cart. We decided to wait for our Neurologist, Dr. Berry, and get a second opinion. When Dr. Berry saw the MRI he just shook his head and couldn't believe that this cutie was still alive as the damage is great. Dr. Berry is like us, he doesn't give up. He told us that he doesn't know if a surgery will make Chance walk again, but if we wanted to give him a shot to walk, then we suggested we do the surgery. Very risky as the spine is deformed. Chance had surgery yesterday, Oct. 5th. He was in surgery for 4 hrs. and only due to the tremendous expertise of Dr. Berry did Chance pull through. We won't know the outcome for several month, he may or may no walk, but we did give him that second Chance. This morning I was told that Chance felt pain on his back legs, which he didn't before the surgery, so we are optimistic. Change MRI was $2,400 and the surgery $4,800, that is not counting the after care. We would appreciate any financial support you can give to this sweet, happy baby boy. Please mark your donation to Chance's Fund. Chance came home on Oct. 9th for around the clock care. He is doing well, still not walking and if he will ever walk we won't know for many months. We just don't know the outcome, but we knew we have to give him a shot at being able to walk. He is such a good little boy. He is in pain but rarely complains. I have to hold the food bowl and water bowl up to him as he can't eat on his own and he is so patient about it. Has a hard time laying down right now, but we are hoping with lots of care, love and therapy he will improve. The surgery cost a lot more than we expected, $6,311 YIKES!!! That is not include the MRI. We ask for your support, every little bit helps. Please keep Chance in your prayers and lets hope a miracle happens to this precious baby. Little Chance is doing well. Hating his physical therapy, I tell him it hurst me just as much as I don't like to cause him pain, but must be done. Though I know it is too early to tell, I feel his back legs are getting stronger. I place his legs and stand him up, while he is eating, and the other day I felt he stayed up for a few seconds. :-) His progress will be slow, but I am praying that this little boy one day will walk. Please keep him in your prayers and pass the words as we are in desperate need of donations! Chance is doing well, still not walking but it will take a while. He started physical therapy at a special therapist. He is going twice a week for 4 hrs. and doing under water treadmills and a variety of special therapy. Unfortunately the therapy is expensive. To get a discount we have to book 5 session and all 5 of them are $500. We can't do this much longer, we signed up for 10 session as that is all we can afford. He will need a lot more than that to have an opportunity to walk. When he goes to therapy he really does well with the strength of his legs and movements. We are trying to raise money to be able to continue his therapy to give him the chance he needs. Happy Holidays every one!! We appreciate you! Sorry for the delay in posting. It is one crisis after another in our world. Chance gave us a big scare last week. During Physical Therapy he collapsed and stopped breathing. Luckily all his Dr's. are at the same facilities and he got immediate care. They got him breathing again, then the battery of test started to find out what is going on. He had blood test done, chest x-rays, etc. etc. When all came back normal, we had to do an endoscopy to see if something was wrong with his airway. The Dr's. found his palate was elongated, which was a shock as he made no noise when breathing or excited. We do palate surgery on about 99% of our Pugs and we are very much aware of the danger of elongated palate. But he had no signs that he had it, so we learned something new. He went into emergency palate surgery. After $3,300 and a day in the hospital he is back home and recuperating. Unfortunately we had to put the physical therapy on hold, until he is all well, which will throw him back a few weeks. I can tell his back legs are getting weaker without PT. The other issue is that we can no longer afford PT for him, it is $500 for 5 sessions, we already paid for 3 - 5 days sessions and between all the other dogs needing care and Chance's latest episode we are tapped out. We are trying to come up with fundraisers and getting sponsors so we can continue getting him to potentially walk. As of right now he is still not walking, but made great strides in being able to eat on his own and lays down like a normal dog, which he was not able to do before. So all in all great improvement for our precious Chance. We urge you to continue helping us with donations, try to find sponsors for us and help in any way you can. What a precious pug! I'll be excited to see Chance's progress in the future - update soon please!! I am so glad to see that Chance is doing well. I saw him at Pugtoberfest before his surgery and just fell in love with him. He is so precious! I pray for a full recovery for little Chance, and will keep watching for updates! Do you have pics of Chance and Sunny and Carina. Would love to see them. How is little Chance doing? Is little Chance able to walk ? Teri, I have 2 dogs with neurological problems, although not as severe as Chance's. I have a couple of suggestions. First, therapy can be done in your own tub by putting towels under Chance's front and back ends (just behind the front legs, just in front of hte back legs) and holding him so his legs are in the water but his feet can't touch. If you can rig up some kind of support using one of those tension rods so you have some help supporting him, so much the better. Let him "swim" in the water for as long as he seems able, increasing the time as you can. The other is to find a nearby lake (when it warms where you are) and take him there as often as possible. 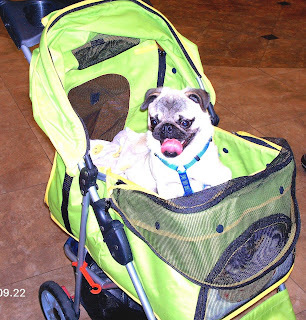 This activity vastly increased our older pug's walking. We put a life vest on him, floated him out into deeper water, and let him swim back. He paddled around when he was out there, but only put full effort into it when he was on his way back. Since we had to stop for winter his progress has slowed, but as soon as we can we will get him back in the lake. 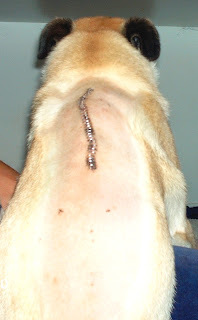 My younger dog is much stronger as he has been recovering for a longer period of time. Now that he can, I encourage him to stand on his back legs at every opportunity, usually when I am sitting down eating. Thanks Sharon, he is going to physical therapy twice a week and does very well on the tredmill. He is getting stronger, but doubtful that he will walk again.